Broadband routers are in wide use today. They enable multiple computers to share a single internet connection, and also provide enhanced security by not allowing arbitrary incoming TCP connections from the internet to reach computers on the LAN (Local Area Network) side of the router. A broadband router can be a stand alone device with one end plugged into your Cable/DSL modem and the other end plugged into your computer or a wireless antenna, or sometimes they are built directly into DSL and Cable modems. Broadband routers keep track of all outgoing connections from the LAN side by maintaining an internal mapping table of which computer on the LAN is responsible for a given outgoing connection to a particular destination on the internet. This allows two-way communication between computers on your LAN and computers on the internet, so long as it was a computer on your LAN that initiated the connection in the first place. When an unsolicited connection comes in from the internet (perhaps from another peer in a download swarm), your router does not know what computer, if any, in the LAN should receive the connection, and will block it. In order to receive incoming connections from the internet to your computer on the LAN side of the router, you need to change a setting in the router's configuration so that it forwards all incoming connections for a particular port number to your computer in your LAN. There are a few different ways to do this. Before you forward a port, you need to know what port numbers Tixati is configured to use. Refer to step 2 and step 3 in the Optimizing Guide for more information. Universal Plug and Play is supported by many broadband routers. It automates the process of mapping an incoming TCP port from the internet to a particular computer on the LAN side of your router. 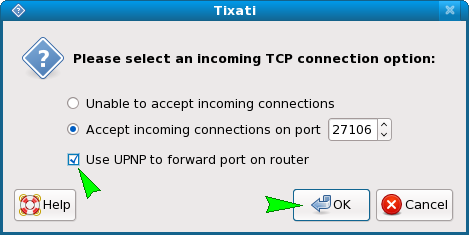 To see if this will work for you, the UPNP option within Tixati needs to be enabled. If this is the case, UPNP is already active, and if you are receiving incoming connections and DHT messages (see step 2 and 3 in the Optimizing guide), then you can skip the rest of the steps on this page. If UPNP was already active and you are not receiving incoming connections or DHT messages, your router probably does not support UPNP and you will have to proceed to the next section below. Repeat this to activate UPNP for the UDP port as well. Now that you've activated UPNP, repeat steps 2 and 3 in the Optimizing Guide to see if UPNP is working for you. Not all broadband routers support UPNP, and some support it but are very unreliable when forwarding incoming connections this way. 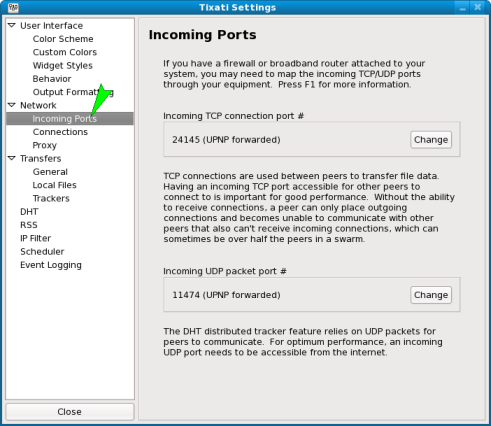 If after activating UPNP and running some transfers and the DHT for a few minutes you still are not receiving incoming connections and DHT packets, you can resort to manually configuring your router to forward incoming connections to your computer on the LAN side of the router. That is covered in the next section. If UPNP is not working for you, this is the alternative. This procedure may be difficult for users that are new to computing and the internet. It is important to remember that receiving incoming connections is not necessary for good performance from Tixati, and if you are not confident when it comes to configuring your router, you may not want to do this. When following the above procedures, make a note of the static IP that you've chosen. The next step is forwarding the port in your router's configuration. This is usually done by directing your web-browser to your router's IP address, which is usually http://192.168.1.1 or http://192.168.0.1 . You will be prompted for a user name and password, which by default is usually "admin" for either the user name or password, or sometimes both. Once you've logged in, you will be presented with a web-based configuration interface that allows you to make the needed changes. Once you've finished configuring port forwarding in your router, you should repeat steps 2 and 3 in the Optimizing Guide to see if you can now receive incoming connections and DHT messages.